Screen Tip is a UI feature which consists of a small window that appears when the mouse cursor is hovered over a particular element. By default each control has a ScreenTipNeeded event which is fired when the mouse hovers over the various elements inside the control. The screen tip extends the tooltips functionality because it can show many different elements including images. Figure 1: A ScreenTip in RadGridView. The RadOffice2007ScreenTipElement is the screen tip that is currently available in the Telerik UI for WinForms suite.This screen tip contains 3 labels and a line which is used to separate the footer. Each label element can display an image as well. The following image shows the elements that are used inside this screen tip. 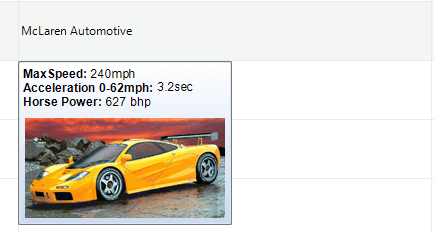 The following example demonstrates how you can show a tooltip when a RadListView item is hovered. Please note that the Item property contains the currently hovered element. 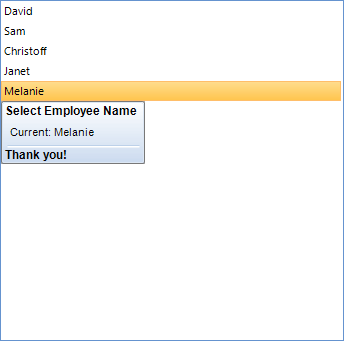 screenTip.CaptionLabel.Text = "Select Employee Name"
To determine which are the exact elements types, just add the following statement to the ScreenTipNeeded event: Console.WriteLine(e.Item), this way when you are hovering the elements, their types will be displayed in the console. You can use this element as the default screen tips.